I really feel that my patience is being tested at the moment. We are trying very hard to ensure that Tuchena is a well-rounded and balanced dog. This is even more important when you have a large dog, as people are a lot less forgiving of bad manners in something they view as a possible threat. If you see a small dog; for example a miniature dachshund, on lead wearing a tiny little muzzle and barking his little head off you are likely to think it looks comical. Imagine a large dog in the same situation and you are likely to poop yourself! We had a situation yesterday where Tuchena was off lead in the field playing with one of her friends when a small dog, as described above came in to the field with its owner. Tuchena got close to this dog but then went in to a ‘down’ position and was just watching it. The little dog then barked and lunged at Tuchena, so Tuchena used dog discipline to stop the aggression (she doesn’t see the lead and muzzle as she is a dog, she sees it as wanting to attack). She verbally warned it and disciplined it by ‘scruffing’ it and pinning it on its back with her mouth. Leon was there in an instant and reassured her and removed her, but the owner of the small (aggressive) dog was going bonkers by this stage and kicking Tuchena calling her aggressive! Some people have no concept of dog behaviour. If Tuchena was aggressive, we wouldn’t have her off lead to start with and she could have caused no end of damage to a mini dachshund, instead of just leaving it covered in saliva. (Leon checked it over to be sure, not a mark on it). I am so angry that someone kicked my dog. It makes you wonder why their dog has the issues it does if they see that as an acceptable form of discipline. If you kick a dog you run the risk of making it aggressive. Also, if you don’t teach your dog basic manners, don’t blame other dogs for trying to teach it the lessons that you couldn’t be bothered with. Bad manners in large dogs are not as easily ignored or tolerated as they are in smaller breeds, but it doesn’t mean that smaller breeds should be allowed to get away with terrorising larger dogs. 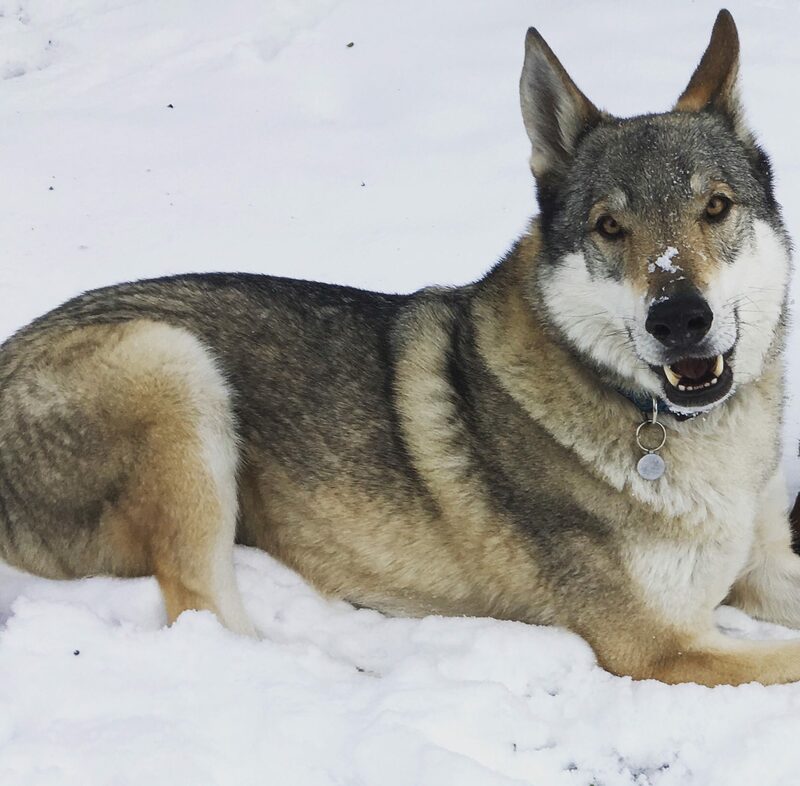 I came across this blog recently about Wolfdogs and it is the best thing I have seen for giving an honest and informed perspective of the breed. If you want to know more about them, I would suggest you follow it…..I am! Just because a dog looks like a wolf, it doesn’t make it dangerous. Just as a wild wolf isn’t dangerous to – but afraid of – humans. Any animal frightened or confused may be dangerous, and so may any human – forced to attack in fear. A dog treated with respect of its genetic background, will be a good dog. A dog mistreated, mislead and with no real (trustworthy) leader will attack. Therefore a lot of the very small dogs bites. Like Chihuahua, Pekingese etc. but they are not considered dangerous because of their size. Few of them are well raised as it is considerable more difficult to raise a small dog than a big one! It’s easier just to move or push the small dog away instead of teaching it the basic rules. This is the basis for SMALL problems. If you raise a big dog that way (Pitbull or likewise), you’ll get MAJOR problems. It hurts a lot more to be bitten by a Great Dane then by a Chihuahua. This doesn’t mean that the Chihuahua is a better dog. A small knife is still a knife. This was taken from the blog ‘Diary of Pandora’ who have managed to put in to words that which I was struggling to say! Somebody kicked her?? I’m absolutely fuming on your behalf, how fecking dare they! How would they have reacted if Leon had kicked the aggressive dog for crying out loud? Like you say, if she had meant it any harm they would have known about it! Thanks honey. Thankfully she seems ok, but I don’t want her to associate humans or small dogs with pain/getting kicked. If it happens again I will report him to the police for animal abuse. I am right there with you! My neighbor walked Rosie for me one day, and a similar thing happened. The owner of the small dog kicked Rosie, and she hadnt even gotten close to the other dog. He kicked her because he was afraid. It is a good thing I was not there! Although my friend was angry enough for me and put the man in his place! I feel your pain, and agree 100% I hope Tuchena did not get hurt. Thanks, she seems ok, but it wasn’t a good experience for her. Poor Rosie, I am sorry it happened to her too. I just don’t get how people think they look scary. I am more afraid of little dogs to be honest! Clearly the man in question is an idiot. The irony that he called Tuchena aggressive after kicking her must’ve flown right over his ignorant head. I totally agree with you! I cna’t believe Tuchena was kicked! (I would of had to hold myself back from kicking the man who did that myself ha!) And it was a mini dauschund none the less, such a small dog with a big bark, which seems to be fairly common. I think what people lack to understand is that all dogs have the capability to be aggressive, though it is the training from the owners that mold the dog’s behavior. Hopefully the two won’t meet up again if the owner is going to act that way. Thanks, I was really cross! Would be good if we never saw them again.